Donegal's attempt to prevent Dublin footballers from designating Croke Park as a home venue during the Super 8s has been rejected at the GAA's Annual Congress in Wexford. The Donegal motion received only 36% support from delegates. 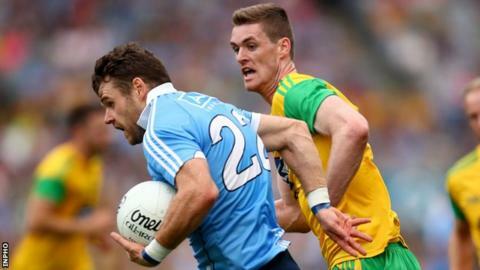 Donegal's proposal was aimed at ensuring Dublin do not always have two games at Croke Park when they reach the Super 8s All-Ireland quarter-finals. Dublin GAA secretary John Costello said Donegal's motion was "divisive". "Croke Park is the headquarters of the GAA. It is the ground every child in the country aspires to play in. It is the county board's view that Croke Park should be used more, not less," added the Dublin official, who said the GAA would have to turn tens of thousands of fans away if Parnell Park was designated as the county's home venue. "I have been attending congress since I was a youth delegate in the late seventies, and I think this is the first motion I have experienced that is divisive and mean-spirited." Former GAA president Sean Kelly also criticised the Donegal motion as "negative". "Anyone who wants to beat the Dubs should aspire to do so in Croke Park," said the Kerry man. "That's certainly what we aspire to do in Kerry as we bid to stop the 'Drive for Five'." Donegal chairman Seamus O'Domhnaill rejected the criticism, insisting the proposal was about "fair play". "There is one team that gets to play two games in Croke Park. It's important we correct the imbalance and there's fairness and openness for everybody," said the Donegal chairman. "Are we more interested in finances or fairness?" Meanwhile, Congress gave overwhelming backing to a Clare motion which called for the ending of the ban on county grounds being used for sports other than GAA. The motion received 91% following the controversy last year over the GAA's delay in allowing Pairc Ui Chaoimh to be used for the Liam Miller tribute match.